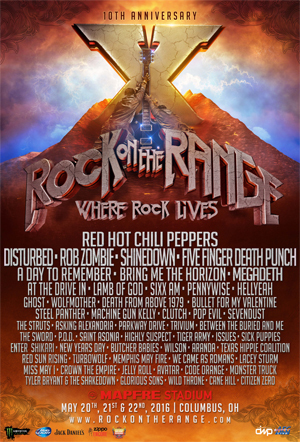 Rock On The Range--the largest and most-acclaimed rock festival in America--has announced additions to the 10th Anniversary festival experience May 20, 21 & 22, 2016 at MAPFRE Stadium in Columbus, OH. In addition, Saturday night’s festivities at Rock On The Range will include a live version of That Metal Show (based on the VH1 Classic program) starring hosts Eddie Trunk, Don Jamieson and Jim Florentine. The live show will feature interviews with various ROTR bands, a “Stump The Trunk” segment, and typical That Metal Show commentary from Trunk, Jamieson and Florentine.